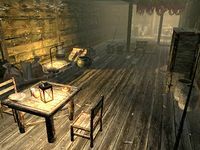 Atheron Residence is the home of the Atheron family in the lower Gray Quarter of Windhelm. It is located across the street from New Gnisis Cornerclub. The house is inhabited by street vendor Aval, farm worker Faryl and their sister, Suvaris. It consists of one area, Atheron Residence. Like all other houses in the Gray Quarter, the Atheron Residence is in poor shape. The front door opens to the sight of a sparsely decorated dining area with a ladder leading upstairs. Three food sacks sit next to the door, with an additional six sacks on the shelves near the two fireplaces. The eastern corner has a bit of food scattered around, some dog meat, a gourd, and a head of cabbage. The dinner table in the center holds some cheap food, a sweet roll, a slice of bread, an eidar cheese wheel, a pile of salt, a sample of troll fat, and a bottle of wine. The most valuable items can be found in a knapsack underneath the ladder; this contains leveled items. Note that this knapsack respawns, and is not safe to store items in. An entrance in the western corner leads to a room with a few tables and a single bed, owned by Suvaris Atheron. 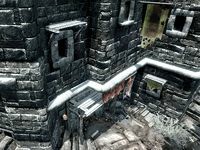 Along the northern wall are two sets of shelves with a potion of minor stamina and two bottles of alto wine, along with some common books. Next to the bed is a dresser with clothes with a sample of scaly pholiota, another potion of minor stamina, and some grilled leeks on top. The small table nearby only has a bottle of alto wine and some bread on display. Lastly, in the southeastern corner stands a wardrobe with clothes. 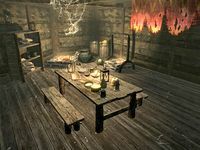 When you head up the ladder you will find a woodcutter's axe near a table with a bottle of Nord mead and a green apple in a bowl. Nearby is a food sack and a dresser with clothes. The entrance in the northwestern corner leads to Aval Atheron's room, with a single bed against the western wall. The northern wall has a wardrobe and a dresser, both with clothes. The small table has a bottle of alto wine and a piece of bread. Back in the room with the ladder is a cooking pot and three food sacks. The table near the eastern wall holds a boiled creme treat and a red apple. The shelves near the entrance to the second room hold little of interest, with a tipped-over food sack on the ground nearby. The room is where Faryl Atheron sleeps, with a handy bottle of alto wine on the ground next to the bed and the wardrobe with clothes. At the foot of the bed is an end table with clutter, with a potion of minor stamina on top. Following the wall is another dresser, with a bottle of wine and a copy of The Ransom of Zarek on top, followed by a chest with random items, a food barrel and a food sack. The small table has an eidar cheese wedge and a slice of bread. All containers in the area are non-respawning, with the exception of some barrels, sacks, and the knapsack.